Rice is among the top two cereals in the world, and is considered as high food security crop. Realizing the potential of rice and it's importance, we have launched an extensive research programme on hybrid and varietal rice improvement. The company has successfully launched four rice hybrids for different agro-climatic conditions and maturity groups. long slender, non-sticky, aromatic and non-aromatic grains with early to mid-early duration for north India. Medium to short slender (fine grain type), non-aromatic grains with medium to long duration for south India. Basmati characteristics for north India. Basmati characteristics with early to medium duration for India. 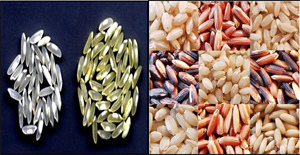 Medium to short slender, non-aromatic fine grain type for major rice growing areas of India.